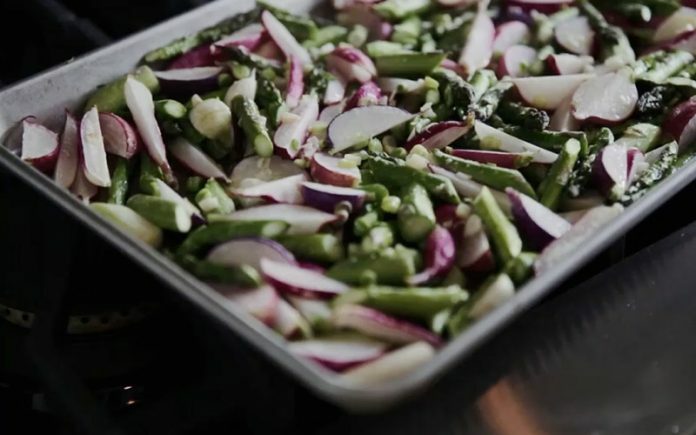 This vibrant side dish pairs asparagus with radishes quickly roasted together. Perfect with an Easter ham, the recipe also fits into a Mother’s Day brunch menu or adds seasonal flair to any weekday meal. Heat the oven to 400°F. Wash the asparagus and trim away the base if woody. Pat dry. Slice the spears into 1-inch pieces and place in a large bowl. Wash the radishes and trim off the taproots. Quarter the radishes and add to the bowl. Add the green garlic, season with salt and pepper, drizzle with olive oil, and toss to combine. Transfer the mixture to a wide baking dish or baking sheet and spread out in a single layer. Roast on the middle rack of the oven until just tender, 10 to 15 minutes. Serve hot or at room temperature.